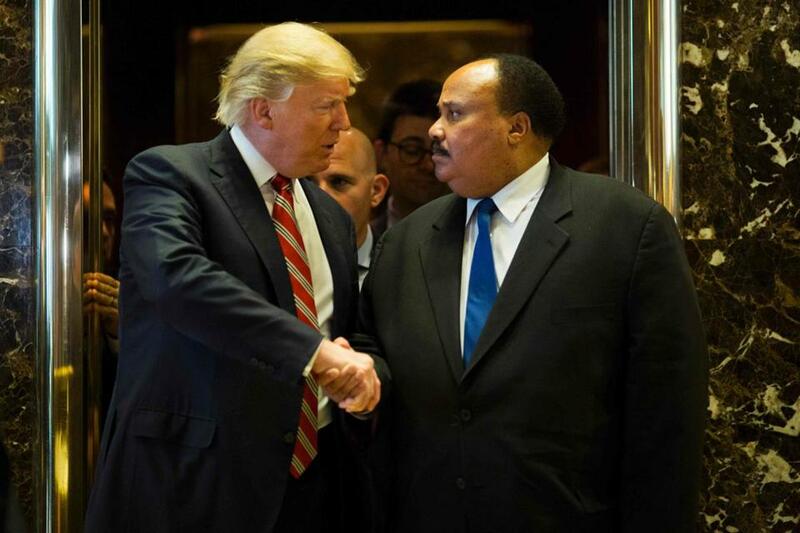 President-elect Donald Trump shook hands with Martin Luther King III after Monday’s meeting at Trump Tower. WASHINGTON — President-elect Donald Trump met Monday with the eldest son of the Rev. Dr. Martin Luther King Jr. on the holiday devoted to the civil rights icon, reaching out to African-Americans who have been alarmed by his rhetoric and policy positions. The hastily arranged session came as tensions escalated between the incoming president and a number of prominent black elected officials after Trump feuded publicly with Representative John Lewis, Democrat of Georgia, who fought for civil rights alongside King. It also highlighted the challenges Trump faces as a president deeply distrusted by minorities. Many have been offended by his false allegations that President Obama was born outside the United States, appalled that his candidacy drew backing from white supremacist organizations, and dismayed at policy proposals they consider antithetical to their interests. Trump, who takes office Friday, did not address those issues Monday. He ignored questions shouted by reporters in the lobby of Trump Tower after emerging with Martin Luther King III from a meeting that lasted nearly an hour. But he made sure that news cameras captured him shaking hands with the civil rights leader, a visual manifestation of his stated aspiration to unite a divided nation. But other black leaders said Trump’s relationship with the black community — tense, bordering on toxic, after a strident campaign that instilled fear, and a transition that has done little to allay their concerns — would not improve unless the president-elect altered both his tone and his policy positions. Trump also said that instead of “falsely complaining” about the election results, Lewis should focus on fixing his “falling apart” and “crime infested” Georgia district. Lewis actually represents a district that includes part of the wealthy enclave of Buckhead; the world’s busiest airport, Hartsfield-Jackson; the Centers for Disease Control and Prevention; and the Georgia Institute of Technology. Trump’s remarks were apparently a reaction to an interview on Friday in which Lewis said he would not attend the inauguration, and did not see Trump as a legitimate president because of questions on whether Russian hacking had affected the American election. “If you can disrespect John Lewis on Martin Luther King Day, then what are you saying about the rest of us?” Sharpton said, adding that no single meeting Trump could hold would alleviate the concerns felt in the African-American community. Senator Bernie Sanders brought the Ebenezer assembly to its feet with his reminder that King was not just an advocate for racial equality, but a radical proponent for economic justice — a mission that put him at odds with the political establishment. ‘‘If you think governors and senators and mayors were standing up and saying what a great man Dr. King was, read history, because you are sorely mistaken,’’ roared Sanders, who invoked the same themes from his failed presidential campaign. Sanders, who struggled to attract black voters in his Democratic primary fight with Hillary Clinton, recalled King’s opposing the Vietnam War as exploiting the poor. He also noted King was assassinated in Memphis, where he'd gone to rally striking sanitation workers, white and black. Obama and first lady Michelle Obama honored King’s memory by painting a mural at a family shelter in Washington.